Around the bit where Front Street becomes Simcoe Park, Mr Monkey found this bronze of a worker chiselling away. This is 'Anonymity of Prevention', part of a pair of sculptures about workers' safety. The other part is a set of 100 plaques, commemerating people who died in industrial accidents in the 20th century. 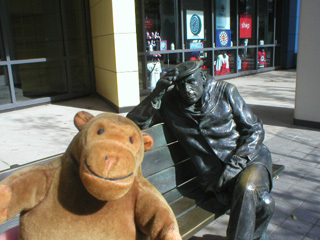 A little down the road Mr Monkey found a bronze Glenn Gould sitting on a bench. He hadn't got his piano with him, though. You can read about the Injured Workers Monument at the Workplace Safety and Insurance Board website, and you can read about Gleen Gould at the Glenn Gould Foundation website.